The day started out inconspicuously enough, with the desire to do a moderately vigorous hike. Although we had the Algonquin loop as a rough starting idea, we weren't entirely sure until we got close to the trailhead, and a number of other ideas were bandied about. A glance at the skies, though, had me thinking that the possibility for an above-the-clouds hike was possible, so we returned to the idea of Algonquin, which had an approach that was short combined with a nice high summit altitude. Starting out under overcast (hopefully soon to be undercast) skies, we quickly made our way up from ADK Loj towards Algonquin. A dusting of snow at the trailhead grew to about 2 inches at altitude, so there was no need for snowshoes. Traction aid was required, however, and microspikes were worked to the max on a very icy trail as we approached treeline. Our hunch was rewarded - a beautiful view of undercast spread out before us, especially so to the west and south. In fact, the most superb views I have seen in the Adirondacks in quite a long time. The descent from the summit southward to treeline was supremely beautiful, with only the 46Rs visible in the distance above the nearly 4000-foot undercast. The descent down to Lake Colden was the worst part of the hike, slushy and slippery and wet. The hike back past Avalanche Lake was a nice final scenic flourish - a warm december sun illuminated the canyon-like area. A re-visit to the little-visited Shepherd's Tooth, on the flanks of Iroquois Peak, at the request of Julie. After seeing my 2009 report on the Shepherd's Tooth, Julie expressed interest. So, this summer I suggested that we retrace our steps. We approached from the Indian Pass side, hiked up to Cold Brook Pass, then did the thick bushwhack up to the Tooth. We followed the same track I recorded for the winter ascent, although in retrospect, I think the route could be tweaked to be a little easier. No matter, the bushwhack was still successful and I can report that the top of the Shepherd's Tooth is as pretty and enjoyable in the summer as in the winter. We completed the day with a triple ascent of Iroquois, Algonquin and Wright before finishing up the loop back to the Loj. See full trip report by following report link below. 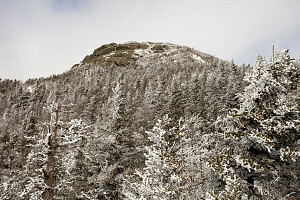 Today, something new: a visit to the little rocky crag on Iroquois Peak's south slopes called the Shepherd's Tooth. The Shepherd's Tooth is an attractive little sub-summit that I've noticed for some time now, and today, we finally decided to do it. We did it as a loop hike, starting at the high peaks info center, hiking through Avalanche Pass, up to Cold Brook Pass, then bushwhacked up from there to the Tooth. We then continued upwards, traversing over the summits of Iroquois, Boundary and Algonquin and descending via the main trail back to the parking lot. As it turned out, the bushwhacking up from the pass was not too bad, although I believe we chose a good route that avoided the worst of the cliff bands that exist above the pass. More information and lots of pictures available in the main report (link below). Another loop climb of Algonquin via the 'back way'. Hiked in through Avalanche Pass and took the trail up from Lake Colden. The day was hot and hazy. On the climb up from Lake Colden, there were good (although hazy) views of the Trap Dike on Colden. I Took a little jog over to Boundary peak (Peter and Andree waited on the main trail going up Algonquin) to get some photos of the summit (of Algonquin) from a good vantage point. Enjoyed a (as usual) busy summit and then headed down the northside trail to Adirondak Loj. A cold early winter day. Only a few inches of snow on the ground, not nearly enough for snowshoes. Pretty cloudy at the Loj but looked possibly hopeful - end the clouds seemed especially low. Nice hike through fluffy snow, except the combination of only a small amount of snow cover and a rocky trail made for slippery going. But... at about the 4000 foot level we climbed OUT of the clouds and over top of them into a brilliant sunny day. Looking back to the north, I could see Whiteface's snow dusted flanks rising out of the clouds! Excellent! I love this above-the-clouds effect and have never until this point ever experienced it in the mountains of the northeast. Feeling very pleased and lucky to have come up here during these conditions, we continue the ascent above treeline (with the help of crampons). 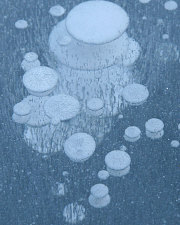 There is not much snow, just some crusted ice. 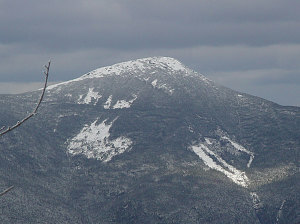 The summit view is fantastic, with a beautiful low-angle light view of the high peaks dusted with snow (in fact, the title banner to this whole section of my web page is a panorama taken from the summit on this hike). I hope to someday experience the same weather conditions while on an ADK high peak! Participants: Andrew Lavigne, Luc Alary, Ewart Tempest, Gilbert Benoit, Andree Plouffe, Martin ? A trip up the 'backside' of Algonquin, as it is called. Strange that this ended up being the first way up Algonquin for me. 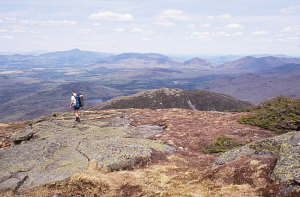 The guidebook describes this as the longest continuous ascent in the Adirdondacks (from Lake Colden up to Algonquin's peak). As always, the hike past Marcy Dam and through Avalanche Pass and Lake was very scenic. The hike upwards from Lake Colden was quite nice, with some nice mini-waterfalls and ever-increasing views back towards Colden, where the Trap Dike was especially prominent. Day was nice but warm and hazy. Up on the ridge, we took a side detour to visit Boundary, and then Iroquois, both nice peaks (Boundary not official being a peak, of course) with open summit areas. A fair bit of muck in some of the low points separating these two, though. Good view of Wallface from the summit of Iroquois. One final burn up the nice open alpine area on Algonquin and we were on top. The usual crowd was here, as was a summit steward, as I recall. From here we returned via the north side of Algonquin and down back to Adirondak Loj.